Upholstery cleaning helps combat the abuse your furniture suffers every day, and here at Manhattan Carpets, our staff have all the know-how to have your sofa or armchair looking good as new in no time. We use biodegradable, all-green, cleaning solutions which are 100% non toxic. Our special hot-water techniques will clean the fabric delicately. Our Scotchguard protection gives it even more protection. Once that is done, we'll deodorize it to leave it smelling wonderful. 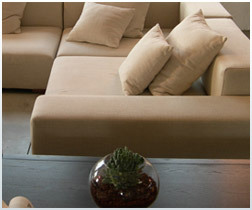 Don't go to the cost of buying new furniture – have your sofa or armchair cleaned by us.